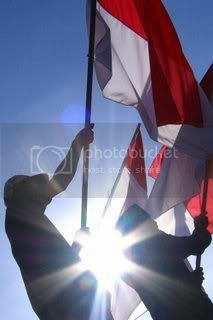 Today is Indonesian's independence day, and just like other Indonesian people I am proud to shout loudly "MERDEKA!!" For you who don't know the meaning of "Merdeka", it is a word in the Indonesian language meaning independence or freedom. It is derived from a Sanskrit Maharddhika meaning "rich, prosperous and powerful". The term merdeka was used in Indonesia in a similar way to designate freedom from the Dutch colonial government during the struggle for independence in the 1940s. Republic of Indonesia declared its Hari Kemerdekaan Indonesia or Proclamation of Indonesian Independence on 17 August 1945, and it is become national holiday and commemorated annually eversince. During struggle of independence in 1945 to 1949, it was used as a national way of salute of victory and honor by raising open palms as high as the head and shouting out loud "Merdeka!". From here many slogans came, such as "Sekali Merdeka tetap Merdeka!" (Freedom once and for all) or "Merdeka atau Mati" (Freedom or death). This is intended to raise the morals of all the people of Indonesia to continue to fight against the Dutch and the Allied forces trying to re-establish a control over Indonesia; it was so important that even it became a Government Edict on 31st August 1945. "Since today we will cry out loud, "Merdeka!". Continue on that loud battle cry, as the soul calls out loud for freedom! A soul of freedom, one of fighting and working spirit! TO FIGHT AND TO WORK! Prove it!" The name "Merdeka" is used as the name of Indonesian stately places, such as Merdeka Palace and Merdeka Square in central Jakarta. Surprised enough to know that I was able to told you much stories about my national history? As for me, showing nationalism also can be done in a fun way. Well, I like movie, so today I'll look at some indonesian movies out there and watch them all the day. MERDEKAA! !